If you love nature, you will be in hog heaven if you visit eastern St. Tammany parish. Southeast Louisiana is home to over a dozen state and federal wildlife management areas (WMA). Some of these areas provide sanctuaries for hundreds of species of birds, reptiles and mammals, while also providing controlled hunts to keep numbers within reason. My blog will concentrate on the areas in or surrounding eastern St. Tammany parish. The Pearl River WMA, previously mentioned on this blog, covers over 35,000 acres with several boat ramps, nature trails birding and canoeing. The Bogue Chitto National WMA extends north of the Pearl River WMA and encompasses 36,000 acres of the Pearl River Basin. This area is considered a bottomland hardwood forest with areas containing sloughs and bayous to explore. The woods contain the bald cypress, water tupelo, the Mayhaw and other water loving hardwoods in the low-lying areas and live oak and pine on the higher grounds. 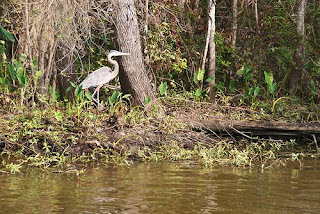 Given the name Bogue Chittio (or Large Stream) by the Choctaw Indians, the area is home to many endangered or threatened species including the ringed-sawback turtle, American alligator, gopher tortoise, inflated heel-splitter mussel, the Gulf sturgeon, bald eagles and the swallow-tailed kite. And is also home to deer, turkey, neo-tropical birds, rabbit, raccoon, a variety of snakes, mink, skunks, wading birds and waterfowl. Trails have been made for those interested in eco-tourism. And there are several ramps for boating as well. There are several entry points north of Slidell near the town of Pearl River.
" Located just south east of the Bogue Chitto NWR. Let us help plan your visit to nature's paradise. The Bogue Chitto is located just north and northwest of Woodridge B&B. To reach the southern tip of the refuge travel 6 miles on I-59 to Pearl River Turnaround Exit 11. Heading east from this exit takes you to a fishing area, turning west will take you toward the Holmes Bayou Trail. The Refuge can also be accessed from Locks 1, 2, & 3 by taking Highway 41 north of Slidell. To reach the furthermost East side of the Refuge, take I-59 North to Picayune, MS (15 miles north of Woodridge B&B) Take HWY 43 to Walkiah Bluff Water Park or to Dumas Wise Road to access the Refuge.